Masanori Gotoh graduated from the Faculty of Science and Technology of the Tokyo University of Science in 1985 and completed his masters degree at the same university in 1987. He received his Ph.D. from the University of Tsukuba in 2003. He worked at Toshiba Corporation and Pharmacia Biotech KK for six and eight years, respectively. He took part in the Construction of Libraries of Human Genes Participating in the Glycosylation Project at the Research Center for Glycoscience of National Institute of Advanced Industrial Science and Technology (AIST) in 2001. At AIST, he took part in the establishment of GlycoGene, Inc., in 2005 and holds the additional post of Chief Technology Officer. Takashi Sato was born in Fukushima. He graduated from the University of Utsunomiya in 1994 and obtained his Ph.D. from the University of Tsukuba in 1999. He participated in the GlycoGene (GG) Project in 2001 and the Structural Glycomics (SG) Project in 2003 at the National Institute of Advanced Industrial Science and Technology (AIST). His recent research interests are protein specific glycosylation mechanisms and glycosyltransferases. Hisashi Narimatsu was born in Naruto City, Tokushima Prefecture. He graduated from the Keio University School of Medicine with the degree of M.D. in 1974. He obtained his Ph.D. in 1979 at the Department of Microbiology in the Keio University Postgraduate School of Medicine. In 1985, he succeeded in cloning the β4Gal-T gene, the first glcyosyltransferase gene cloned in the world, at Dr. Pradman Qasba's laboratory in the U.S. National Institute of Health. He returned to the Department of Microbiology in Keio University as an assistant professor in 1986. After worked as a professor at the Institute of Life Science, Soka University for 9 years, he entered Research Center for Glycoscience (RCG) in National Institute of Advanced Industrial Science and Technology (AIST) and served as a deputy director for 6 years. In 2006, he founded Research Center for Medical Glycoscience (RCMG) in AIST, in succession to RCG. He is currently the director of RCMG and the leader of Glycogene Function Team. He is also a profe ssor teaching at the Graduate School of Comprehensive Human Science in University of Tsukuba. Since the chondroitin synthase (ChSy/CSS1) gene was cloned by Kitagawa et al. in 2001 1, six enzymes synthesizing the sugar moiety of chondroitin sulfate have been discovered. These enzymes have a high amino acid sequence homology and are thought to have the activity of transferring at least GalNAc or GlcA. This article reviews existing information on these six enzymes. A set of glycosyltransferases synthesizing chondroitin sulfate has highly homologous amino acid sequences. Fig. 1 shows a phylogenetic tree constructed using GENETYX and an outline of the domain structures. The first discovered ChSy has a transmembrane domain near the N-terminus, followed by a β3GT domain (shared by the β1,3-glycosyltransferases and having a β3GT motif) and a β4GT domain (shared by the β1,4-glycosyltransferases and having a β4GT motif). The six enzymes are divided into three groups of two enzymes (see the phylogenetic tree in Fig. 1). The glycosyltransferase with the highest homology (62% at the amino acid level) to ChSy is chondroitin sulfate synthase III (CSS3)2. The second group consists of chondroitin sulfate glucuronyltransferase (CSGlcA-T)3 and chondroitin sulfate synthase II (ChPF/CSS2)4,5. Like ChSy, they are long glycosyltransferases consisting of dual glycosyltransferase domains, and have a well conserved β3GT domain and a relatively low homologous β4GT domain. The 3D structure predicted by reference to β4Gal-T1 has suggested the presence of a loop at two sites 5. The two enzymes have a high homology of 57% with a very similar exon/intron structure. The third group contains chondroitin sulfate GalNAc transferase I (ChGalNAc-T1/CSGalNAc-T1)6,7 and II (ChGalNAc-T2/CSGalNAc-T2)8,9. These enzymes are glycosyltransferases that contain no β3GT domain, consist of a transmembrane domain and a β4GT domain, and have a high amino acid sequence homology of 60%. The domains contained in each glycosyltransferase indicate its activity. 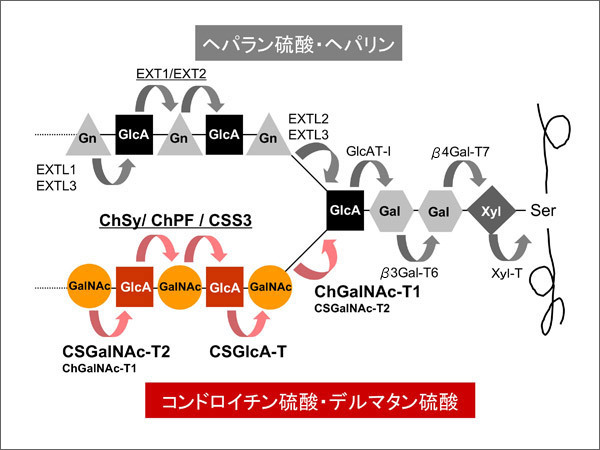 The dual-domain enzymes ChSy and CSS3 exhibited GlcA transferase activity to GalNAc and GalNAc transferase activity to GlcA, suggesting that the β3GT and β4GT domains have β1,3GlcA-T and β1,4GalNAc-T activities, respectively. Compared with those of CSS3, ChSy had one order of magnitude higher GlcA-T and GalNAc-T activities (paper on CSS3) but, singly, they showed no chondroitin elongation activity 1. 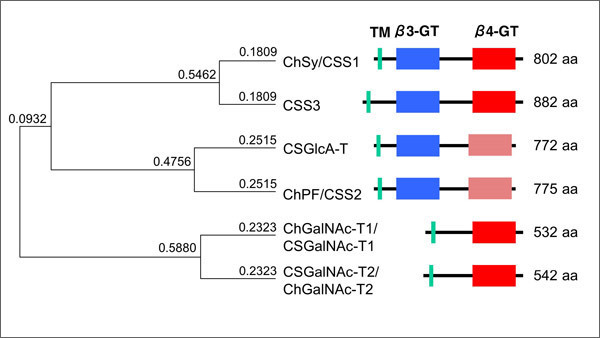 CSGlcA-T in the second group exhibited only β1,3GlcA-T activity, whereas ChPF showed, in addition, weak β1,4GalNAc-T activity. An interesting finding was that although ChSy alone had no detectable chondroitin-chain elongation activity, the coexpression of ChSy and ChPF enabled the chain elongation 4. Both ChGalNac-T1 and CSGalNAc-T2 in the third group have β1,4GalNAc-T activity. Details of the substrate specificities are still unknown; however, at least to certain proteins, ChGalNAc-T1 exhibited strong chondroitin-synthesis initiation activity (GalNAcT-I activity), whereas CSGalNAc-T2 exhibited strong chondroitin-chain elongation activity (GalNAcT-II activity)8. These genes were expressed in all tissues examined, although the levels differ 2,5,8. This is consistent with the presence of chondroitin sulfate in all tissues as the extracellular matrix. Only the co-presence of all these enzymes appears to enable the synthesis of chondroitin sulfate. The above results are summarized in Fig. 2. As in the synthesis of heparan sulfate, the enzymes transferring two kinds of monosaccharides and those transferring only one kind of monosaccharide exist. Further studies are needed to elucidate the details of how these enzymes interact to synthesize chondroitin sulfate.